I have worked with Sridevi only in English Vinglish. In the hindsight, I will say that Sridevi was very different from other commercial actors of Bollywood. The mainstream Indian actors and I mean both male and female, perform for the audience and miss out the truth of the given situation. But Sridevi was unique and truthful with her display of emotions and with her feelings. This was something very significant because we need to remember that while we had been always acting for the audience, since time immemorial, nowadays we perform to make a profit. Sridevi displayed through her acting the higher realities of humanity without sacrificing the profit motive. I found Sridevi to be vulnerable. But her vulnerability was actually an indication of her inner strength. Sridevi was a compassionate listener. She had a confidence which, honestly, I lacked. Sridevi was courageous enough to let go her mask, which we all wear. We rarely can put off our guard. But she did. Sridevi soaked in the realities, let things happen to her. Consequently, what her audience got is responsive, not reactive acting. And, how do I know that? I know that because on the set of English Vinglish, we would be discussing scenes for an hour. And Sridevi would be in the corner, reading a book. Suddenly, she would say a joke and we would all crack up. We realised that she had been listening to each one of us carefully. She was definitely a good listener and that's one of the most important capitals of an actor. You must listen, only if you listen, you can apply. The fundamental training that we got as an actor was to listen. Listen to your co-actor. Sridevi was equally competent in all kinds of roles, be it Sadma or her last film, English Vinglish. The levels of maturity that she had and that orientation of action that she had about good and bad acting helped to bring out the elegance in both the roles that she had played in Sadma and English Vinglish. When Sridevi took a gap of 15 years and then came back to acting, it did not seem like she had left acting at all. When she came back to Bollywood with English Vinglish, she was way more matured with the experiences of being a mother, wife and homemaker. She had now much more to perform and immediately connected with the audience. Having born in this part of the world, Sridevi had those amazing qualities of grace and elegance. She was, like my mother and wife, patient and elegant. As I said, Sridevi found a way of holding, of retaining the truthfulness of her acts and yet playing out for the audience. Unlike the western style of acting, very few in Indian film genre actually acted the way Sridevi, Amitabh Bachchan, or Balraj Sahni did. I don't believe in rumours, so I have nothing to add to the many theories spun around her death. But I would certainly say that in Bollywood the difference between an actor a model is getting increasingly blurry. Most of the costume designers that I have met come from a fashion industry. They dress actors like fashion models. A lot of people go from modelling to acting; this shows the quality of acting that we choose in the film industry. I don't deny, some of them could be very good actors but the kind of complexity that an actor brings, well I don't see that at all now. Dimensional characters, such as Sridevi, are hard to find now. In fact, I don't think they are even anymore demanded because if we are not demanding those layers. So now, the victims are not only the models but the actors as well. they have to work towards fitting into that concept of cool and beautiful. This opinion piece is based on an interview that Adil Hussain gave to WION. 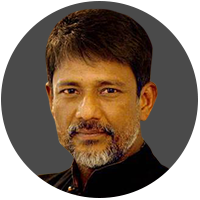 Adil Hussain is Indian stage, television and film actor who works in mainstream Bollywood as well as art house cinema.